Henry MacLaren, 2nd Lord Aberconway (1878-1953). Anonymous sale; Christie's, London, 29 November 1963, lot 165, as 'Timoteo Viti'. Anonymous sale; Christie's, London, 16 June 1967, lot 71 as 'Timoteo Viti'. 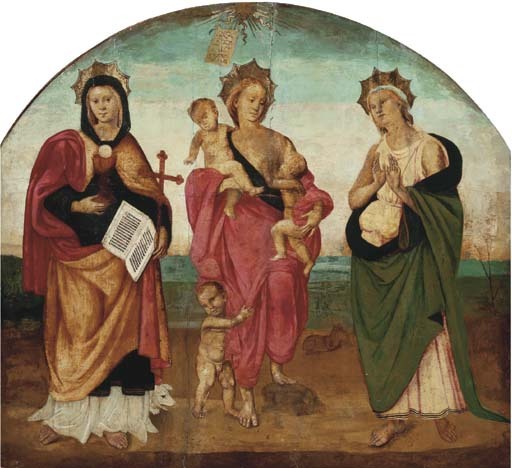 Traditionally attributed to Timoteo Viti, this picture is by an unknown artist under the direct influence of Pietro Perugino. We are indebted to Everett Fahy who points to similarities in works by the Sienese painter Girolamo Pacchiarotto - to whom the distinguished group of pictures now recognised as by Pietro di Francesco Orioli was formerly attributed - published by Fiorella Sricchia Santoro in Prospettiva, no. 29, April 1982, pp. 14-23. Everett Fahy points out that the late-Perugino-like drapery accords well with that of the saints in the triptych in the Oratorio della Misericordia, Siena (her fig. 3), and the faces of the putti are similar to those of the Christ Child in the John G. Johnson Madonna and Child Enthroned (her fig. 4).